Contact SEC Medical today, to learn more about the Optim Mobile FEES System, including a 1-Day Equipment Training, by our SLP FEES Specialists. Leading Clinical Performance. Optimal User Simplicity. Proven Support. 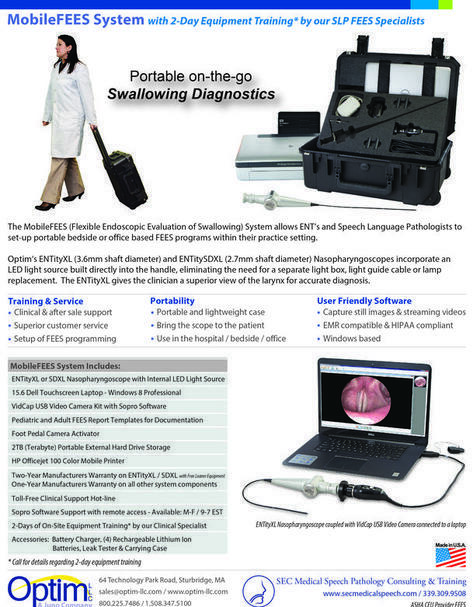 Optim is leading the way in providing portable swallowing diagnostics for the Speech-Language pathology community. Designed to optimize the freedom to perform the Flexible Endoscopic Evaluation of Swallowing (FEES) procedure in a variety of settings, the ENTity™ MobileFEES system enables procedures from patient bedside, to office settings, or throughout the hospital. The ENTity MobileFEES system is the optimal choice for nursing homes, rehabilitation, hospitals, clinics and independent Speech Language Pathologists. ENTity powered imaging and illumination, the MobileFEES system begins with the innovative ENTity Flexible Laryngoscope, with high quality optics and no light cables or light boxes required. The system includes a specialized, custom portable carrying case allowing the system to be brought directly to the patient with ease, enhancing patient diagnostics and patient comfort. MobileFEES system operates a Windows-based software with FEES report templates that allows users to capture still images, as well as record streaming video, providing documentation that can be easily printed or shared. There are various options for storage and is also EMR compatible. MobileFEES users receive onsite equipment training and software installation guidance from Optim’s clinical FEES support team. Optim delivers a combination of clinical support, technical customer service, and broad after-install support. The MobileFEES System can utilize both the ENTity XL flexible laryngoscope, a standard 3.6mm for traditional anatomy, or the ENTity SDXL with a slim, small 2.7mm diameter for patients with smaller or more difficult anatomy. Optim’s ENTity VL Stroboscopy System can now be added to the MobileFEES System for easy-to-use, cost-effect stroboscopy exams.